Technology has matured. Say good bye to the juvenille glow-in-the-dark stars on your ceiling and hello to the glowing world of phosphorescent ink wallpaper. Ich&Kar’s Phosphowall is an unusual wallpaper collection made with phosphorescent ink that soaks up natural or artificial light by day and glows in the darkness of night. Ich&Kar’s wallpaper was elected as the unanimous winner of the Wallpaperlab 2008 and is exhibited at the Musée des Arts Décoratifs in Paris. Each roll is 33’ long by 1’8” wide, priced at $41.00 CAD per and available in multiple patterns and colour ways. 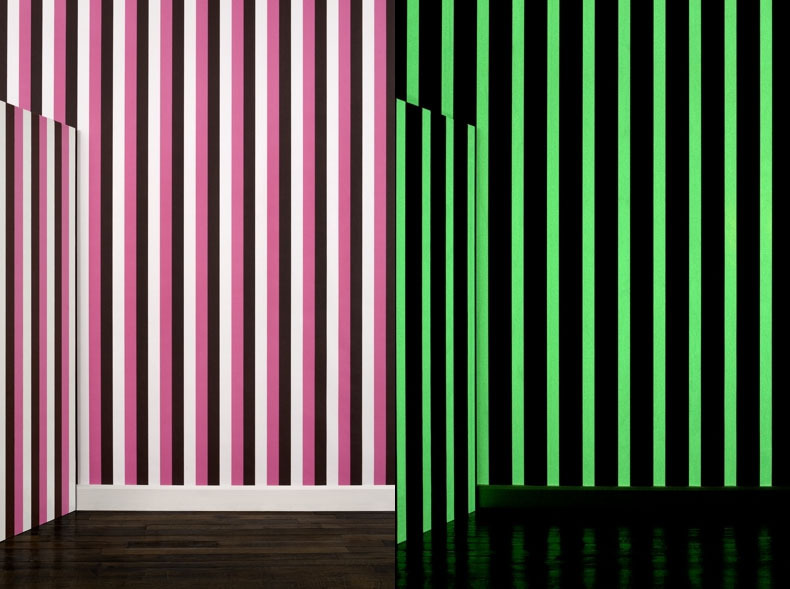 The luminous paint used in the Phosphowall wallpaper is phosphor free, in accordance with DIN EN 71-3. A specific kind of photoluminescence, phosphorescence is defined as a luminescence that is caused by the absorption of radiations (ex. natural or artificial light) and continues for a noticeable time after these radiations have stopped; this is the glowing we observe. Unlike most illuminations, phosphorescence glow does not produce any heat. I personally will be buying this wallpaper for the office in my new apartment. I like the playfulness of the product, the way it gives off a soft glow when the lights are turned off, all while looking like the wallpaper of a design-savvy individual. The sense of nostalga I feel sends me back to being a youngster, staring up at my ceiling dreaming of the great world around me. I really like the idea of taking an old technology discovered in 1896, that was popular in the 1970’s and 1980’s and remarketing it for modern adult consumption. The wallpaper can even be used as a safety precaution, illuminating areas like stairs and hallways late at night.